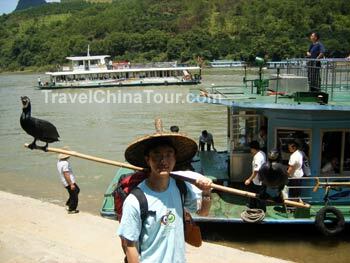 A photo of me at the Yangshuo docks - looking like a fisherman. 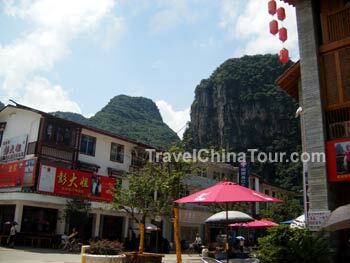 Yangshuo is a small city located in the heart of the Li River valley, about 65km away from Guilin city. It has a population of only 298,000 covering an area of 1428 square kms. 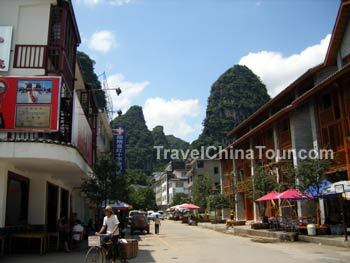 Yangshuo was established as a county in the Sui Dynasty in 590AD. The weather in Yangshuo is a subtropical monsoon climate with nice weather all year around - it's not too hot in the summer, and not too cold in the winter. Yangshuo has become an extremely popular tourist destination in Guangxi province, and there are over 20 scenic spots around the Yangshuo area. If you've read my previous blog entries about Guilin, you'll know that there's a popular phrase that says "Guilin's mountain and water is the best under the sky", and I'm going to let you know that there is another saying about Yangshuo, which is: "Guilin's scenery is the best under the sky, but Yangshuo's are even better." So you can imagine the scenic spots around Yangshuo are truely beautiful. You can read more about Yangshuo here. After exiting the Yangshuo docks, there's a long path that's lined up with small street vendors on the two sides selling all types of souvenirs. Remember to bargain if you decide to buy anything here. The long path from the dock exit, leading to the parking lot. Our tour group was told to follow the long path all the way to the end to a parking lot where we will have a ride waiting for us. It was roughly at 15 minute walk while spending a little time browsing through the various souvenirs that were for sale. When we got to the parking lot, there were these small carts waiting for us that can seat about 7 people. 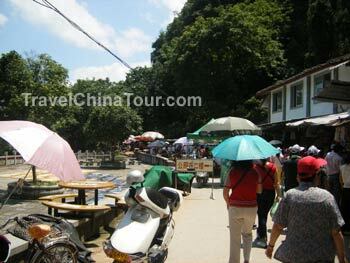 We got on the carts, and were driven through Yangshuo city, where I managed to take some photos. Yangshuo is set right in the middle of mountain ranges and right along side the Li River, so the scenery around this area is just stunning. Mountain peaks surround Yangshuo city. After about a 15 minute drive, we arrived at a large parking lot for tour buses where our tour group gathered on the tour bus, and headed out to our next destination near Yangshuo.